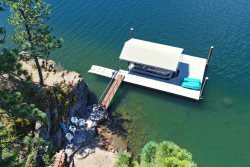 We offer the highest quality boat rentals throughout the Coeur d'Alene area. Our prices cannot be beat and we work hard to accommodate all your needs to make your time on the water a time you will never forget. Contact us today and get out on the water in this wonderful brand new 2016 Harris tri-toon pontoon boat! This pontoon boat features a 115 HP motor, with seating for 12-16. Brand NEW for 2015! Tri-Toon and lifting stakes let you cruise at nearly 35 MPH!